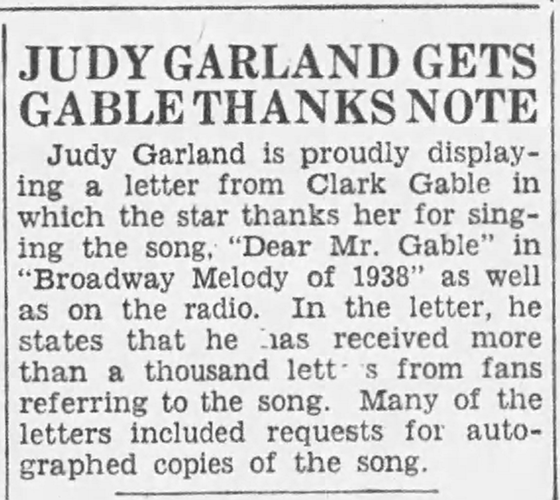 January 16, 1938: Broadway Melody of 1938 was just a few months old when this obviously studio-fed blurb about Clark Gable’s reaction to “(Dear Mr. Gable) You Made Me Love You” was published. Although it’s fiction, it’s a great example of the impact of the song and Judy’s performance of it. January 16, 1938: When the school bell rings on a movie lot. 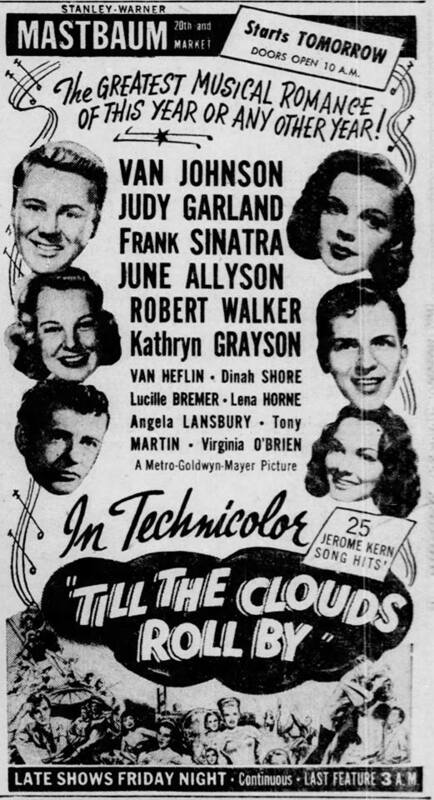 January 16, 1938: Judy named the “best kiddies” in films for 1937. 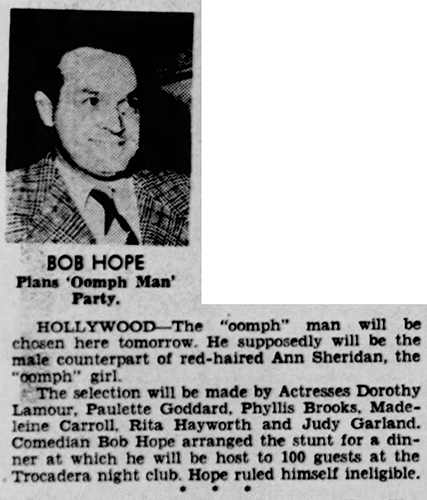 January 16, 1940: Judy appeared on “The Pepsodent Show Starring Bob Hope” broadcast by NBC Radio. 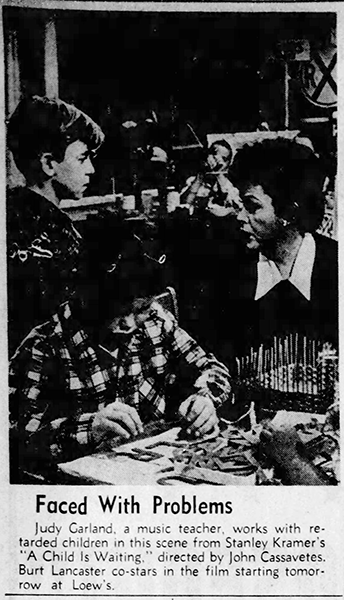 This was Judy’s weekly appearance, although she missed the previous week’s show (January 9) due to the fact that she was on a short trip to Chicago, Illinois and Milwaukee, Minnesota. She did not visit her birthplace of Grand Rapids, Minnesota. 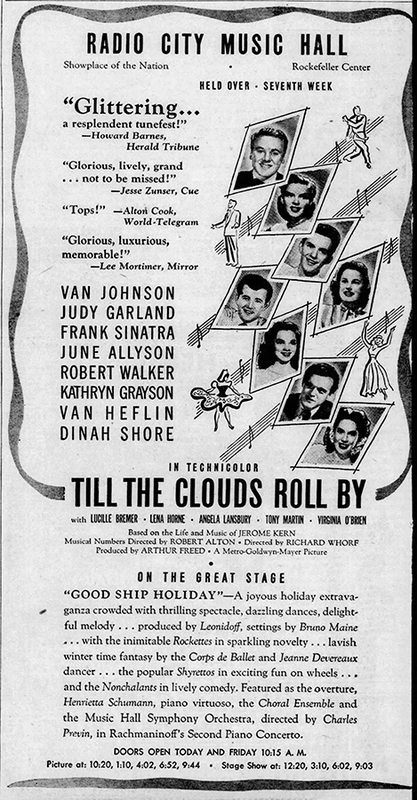 Judy performed “Blue Skies” and took part if a search for the perfect “oomph man.” No recording of this show is known to exist. 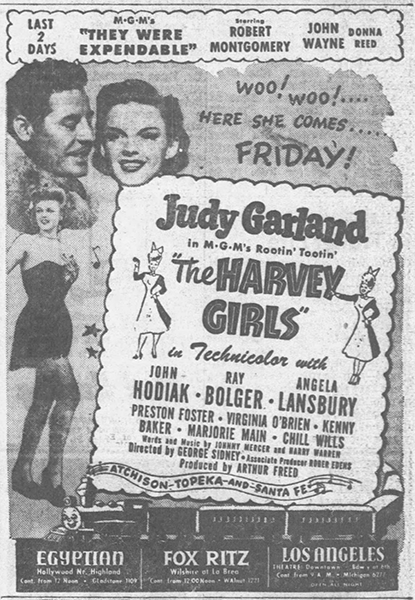 January 16, 1946: Check out The Judy Room’s Filmography Pages on The Harvey Girls here. 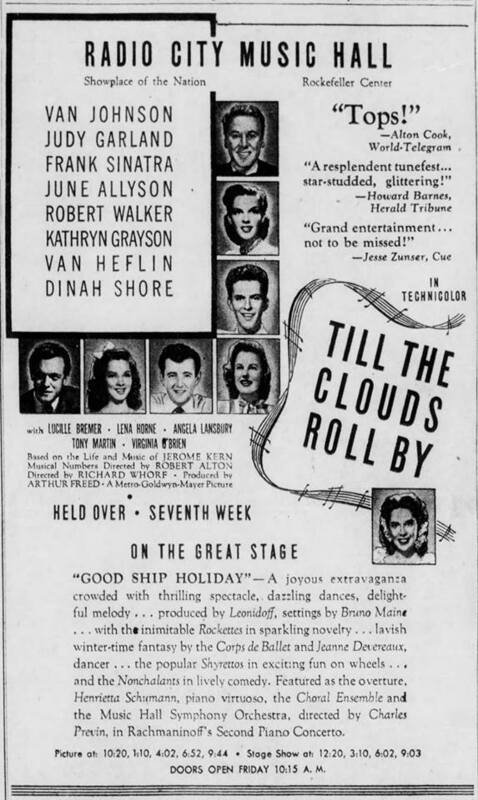 January 16, 1947: Till The Clouds Roll By was playing Radio City Music Hall in New York as well as other theaters around the country. January 16, 1950: Here’s something interesting. 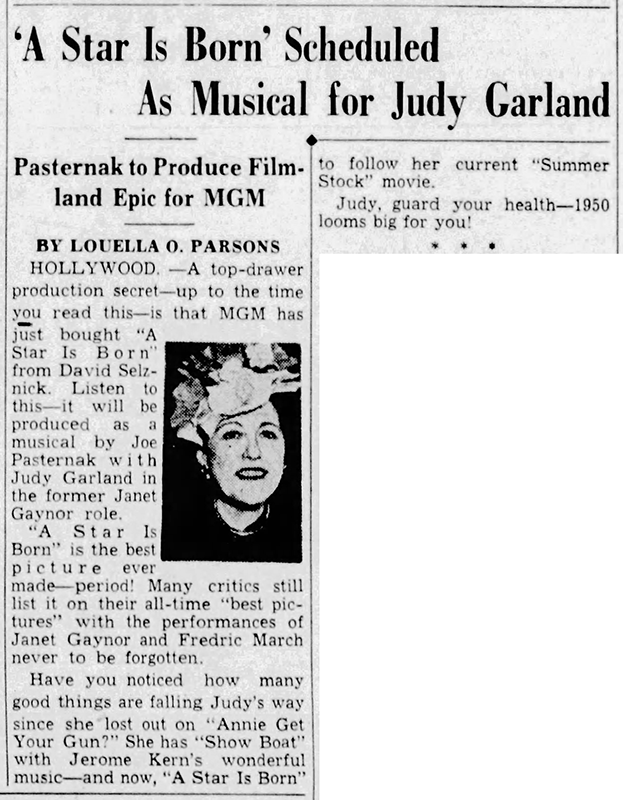 Louella Parsons reported in her column that MGM had purchased A Star Is Born with the intent of starring Judy, to be produced by Joe Pasternak. The story is not true as most Garfans know. At this time Judy was in the middle of filming Summer Stock which was proving to be an extremely difficult shoot and ended up being Judy’s last film for the studio. Judy had made it known at the studio that she wanted to a version of the 1937 film ever since she performed a dramatic radio version of it for the Lux Radio Theater on December 28, 1942. MGM flatly refused her request, reasoning that the public would not take to their girl next door (Judy) being married to an alcoholic husband in such a dramatic story. Where Parsons got her info is anyone’s guess. She probably cooked up the story after Judy told her about her desire to make the film or possibly she overheard Judy talking. Whatever the case, Judy wasn’t able to make the film until 1953/1954, at Warner Bros., not MGM. Parsons did get Judy’s proposed casting in Show Boat correct. 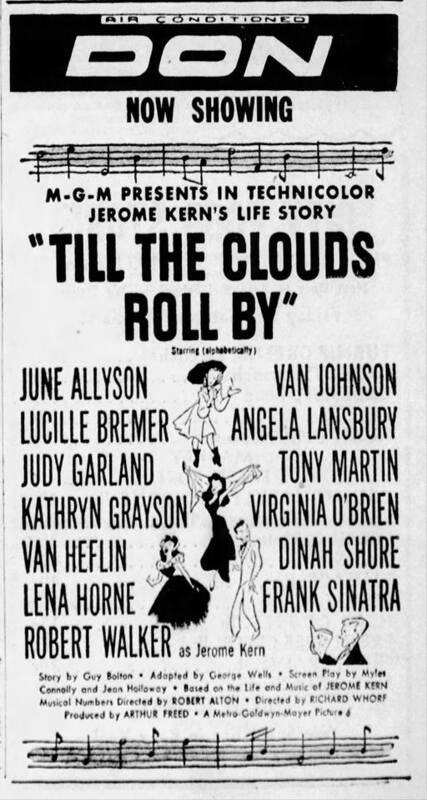 MGM musical producer Arthur Freed wanted Judy for his big Technicolor remake of the classic musical, although at this point he probably realized casting Judy as the tragic “Julie” wasn’t feasible. After Summer Stock and an all too short rest, MGM cast her in Freed’s production of Royal Wedding, which she was unable to complete. For more about all of the projects that Judy was either wanted (or in the running) for or started and was unable to complete, check out The Judy Room’s “Films That Got Away” pages. 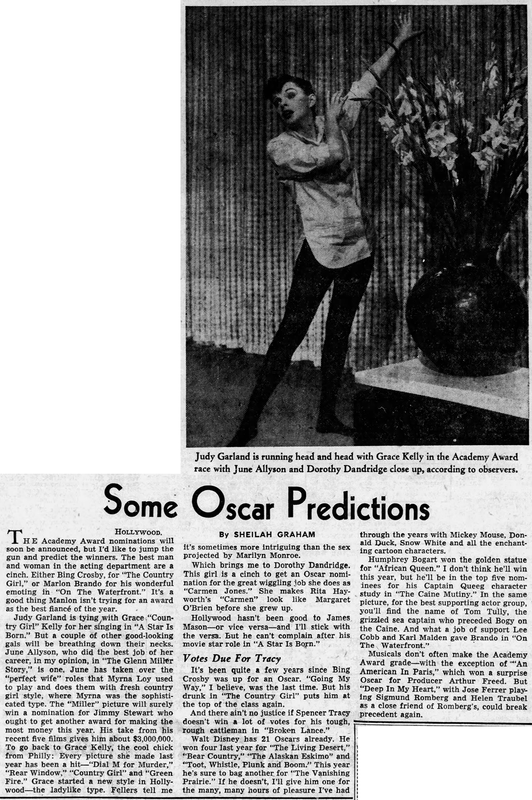 January 16, 1955: Oscar predictions. 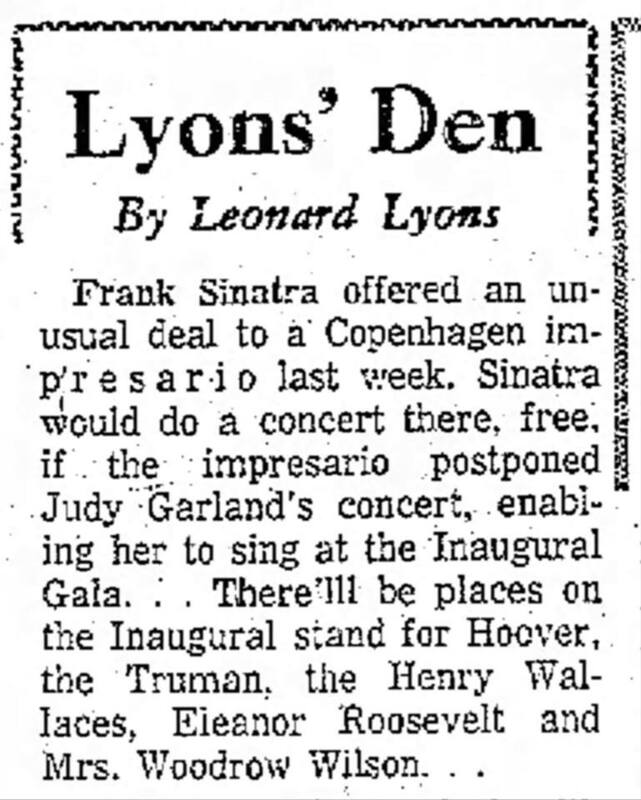 January 16, 1961: Leonard Lyons’s column reported that Frank Sinatra was working out a deal with “a Copenhagen impresario” to do a free concert with them if they would postpone one of Judy’s concerts so she would sing at Kennedy’s Inaugural Gala. John F. Kennedy had just been elected President and the inauguration was scheduled for January 1961. Judy didn’t sing at the Inaugural Gala. She wasn’t in Copenhagen, either. In January of 1961, she gave her concert in Miami, Florida then on January 12th she was living at the Carlyle Hotel in New York followed by a move to the famous Dakota apartment building. She was about to go into filming her supporting role in Judgment at Nuremberg after taking her concert to the Catskills, New York and Dallas, Texas. It’s a shame she didn’t sing at the Inaugural Gala. That would have been something! Part one of Louella Parson’s stories about Judy was published, itself part ten of a ten-part series by Parsons about the people she knew in Hollywood. Her stories about Judy took up parts nine and ten, closing out the series. ONE of the most exciting experiences in my entire career as a reporter was a Judy Garland concert at Carnegie Hall in New York in 1961. After hearing that God-given voice, the audience was hysterically excited. There were demands for more and more songs. What interested me the most was that after the concert teenagers rushed en masse toward the stage. When Judy had sung every song in her repertoire, she brought out her daughter Liza Minelli [sic], now a pretty, dark-eyed teenager, who sang and danced with her mother. To cap the climax, Liza brought out her little brother, Joe Luft. Then Judy, who has poise, shook hands over the footlights with this group of half-hysterical kids. Nothing could have done my heart so much good as to have witnessed this triumph. For Judy has been a part of my Hollywood for more than a quarter of a century and I’ve been writing about her when she was happy and writing about her when she was dulled with heartache; writing about her when she was on top of the world and when the whole world appeared to have descended on her. If ever there has been a Hollywood true story that has run the gamut of emotions, it has been the story of the girl born Frances Gumm. I have heard it said that much that happened to Judy was the fault of Hollywood. I can’t agree. I can only say, however, that it could only have happened in Hollywood. THE last time we talked heart-to-heart she was easy, relaxed and happy after the upturn her career has taken. 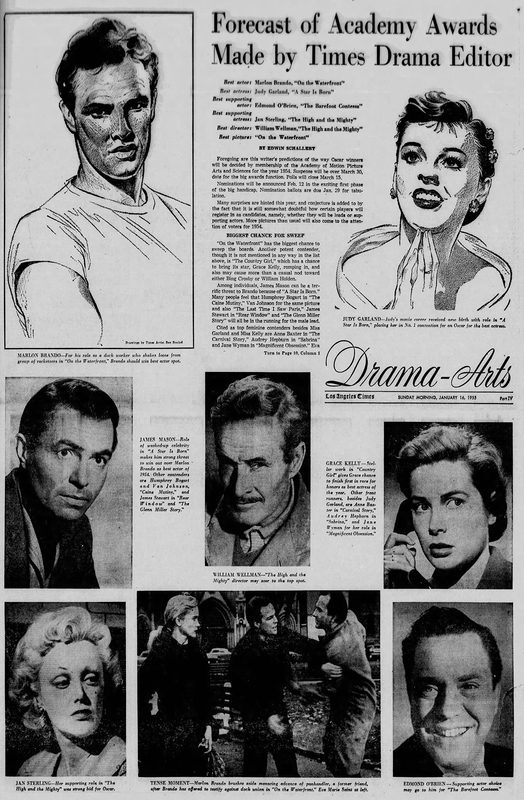 She was in Hollywood to play a small part in “Judgment at Nuremberg.” Judy playing a small part! 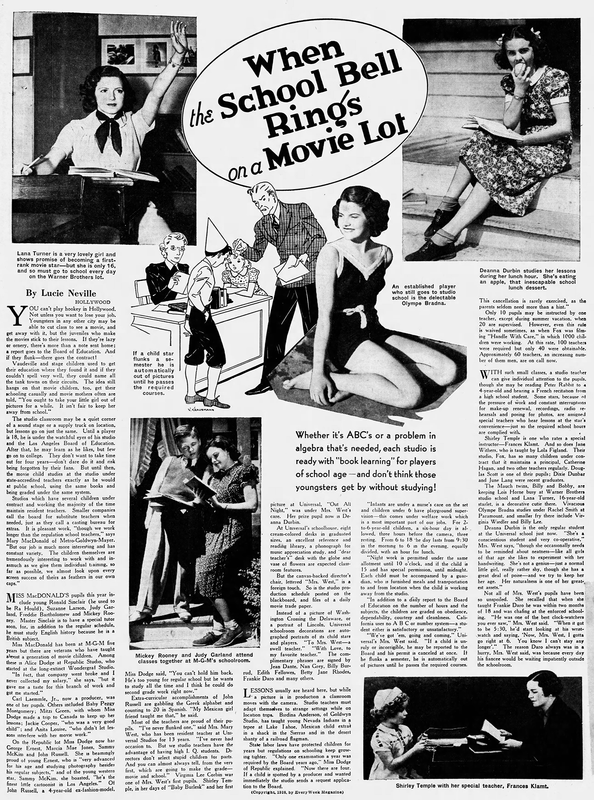 Why, once a studio – MGM – was happy to spend a million dollars for a story in which she could star. I had the feeling when I talked to her this time that Judy was far more in command of herself than she had been in earlier days. And I was happy for her. Happy as I have been all during the years whenever it seemed that she was going to fight her way back from miasma which all to often enveloped her. In my playroom are all the records that she ever made. At times, when I felt the need to cheer myself – to be made to realize that things are not as bad as they may appear – I have played some of those records. When that golden voice has come out of the speaker, I have been able to pull myself together. Judy’s singing has always had that inspiration or consolation for me. “How did ‘Judgment at Nuremberg’ go, Judy?” I asked her as we sat in my garden. 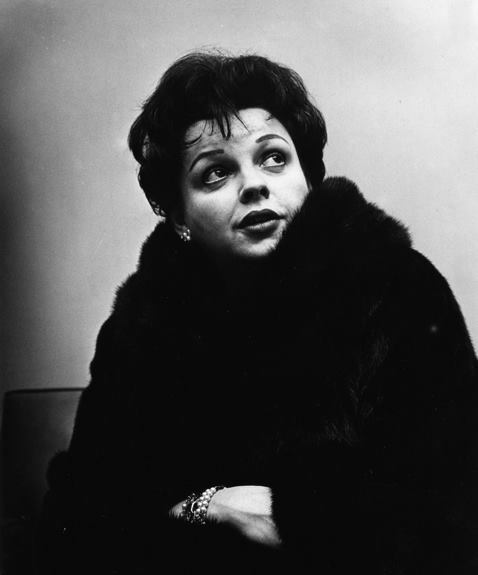 Thus Judy Garland as a name was created. A whole generation has passed since she first sang in pictures. She was one of a group of talented youngsters who were big box-office attractions before their heads were high enough to reach a box-office window – Judy, Deanna Durbin, Mickey Rooney, with whom Judy appeared in so many hits. Judy and Mickey were under contract to MGM. Together they went to the studio school, played on the back lot, practiced dancing and singing routines. Those were the glory days of MGM and of Judy. The sound stages were always in use. Pictures were being prepared by the dozens. And Judy was right in the center of it all at the age of twelve. I find myself wondering now if Judy never grew up or if she grew up all at once. I suppose both could be true. Certainly when Judy was sixteen, she was no longer a child. She was a star who, in 1940 and 1941, was listed among the 10 biggest box-office draws. She lived in a huge hoe in exclusive Bel Air, bought with money she had earned. And she lived like a star, in the grand manner. I knew her quite well and was aware that she had conflicts which were already causing her to fight herself. She was always “on,” always performing. The excitement, the nervous tension which so many others could leave at the studio when the day’s work was done, were always around Judy’s shoulders like a cloak. Seemingly, Judy needed frenzy to exist. She thought it out. Matured prematurely, her friends were older, more sophisticated, more worldly. They lived on excitement, sensation, jam sessions and late hours. WHEN only fifteen, Judy fell completely in love with a married man. There was nothing her friends could do about it. She had thrown herself without reservation into this love affair; she carried a torch visible for miles for a man who couldn’t marry her. To impress him, to make herself more desirable, she fought against weight – a fight that has been never-ending with her. Because impressing him as a woman meant so much to her, she managed to slim down to where her figure was envied by women. When her romance proved unhappy for her, Judy’s reaction was to eat. That was her solace. Putting on weight only made her more unhappy and interfered with the one solid thing that she did possess – her career. Judy became more involved in self-destruction. Dieting and unhappiness had sapped both her strength and her energy. A so-called friend, an older woman, suggested a solution. Why not try “pep up” pills? She did try them and they had an even worse effect: They pepper her up to such an extent that it was necessary to give her sedatives each night so that she could sleep. This was the beginning of a vicious circle – so vicious that, as I think of it, I wonder that she was able to save herself from destruction. Love came to the rescue – appeared to have come to the rescue – when she was nineteen. That was Shen the man with whom she fell in love was David Rose, the talented composer – then just beginning to make his mark. He was some years older than Judy, just enough, we hoped, to be a steadying influence. They married in July 1948, and Judy’s friends told themselves that this would prove an answer to her problems. She was in love. Her husband loved her. They both had talent and the world was their oyster. Only it didn’t work out that way. 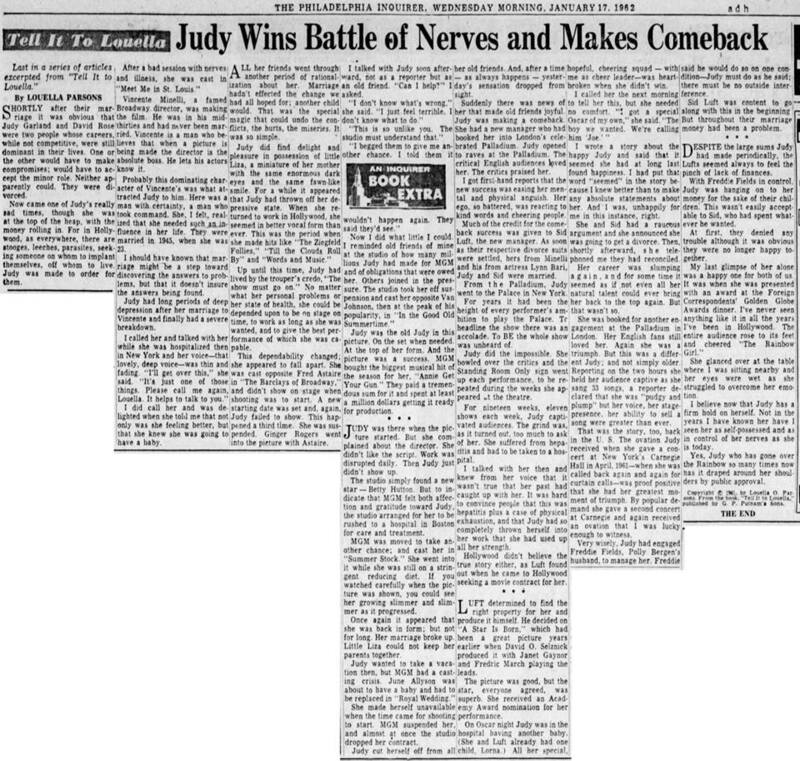 Judy Room note: The second part of the Judy segment was published on January 17, 1962, and was the tenth and final installment in Parsons’ series. SHORTLY after their marriage it was obvious that Judy Garland and David Rose were two people whose careers, while not competitive, were still dominant in their lives. One or the other would have to make compromises; would have to accept the minor role. Neither apparently could. They were divorced. Now came one of Judy’s really sad times, though she was at the top of the heap, with the money rolling in. For in Hollywood, as everywhere, there are stooges, leeches, parasites, seeking someone on whom to implant themselves, off whom to live. Judy was made to order for them. Vincente Minelli [sic], a famed Broadway director, was making the film. He was in his mid-thirties and had never been married. Vincente is a man who believes that when a picture is being made the director is the absolute boss. He lets his actors know it. Probably this dominating character of Vincente’s was what attracted Judy to him. Here was a man with certainty, a man who took command. She, I felt, realized that she needed such an influence in her life. They were married in 1945, when she was 24. I should have known that marriage might be a step forward discovering the answers to problems, but that it doesn’t insure the answers being found. Judy had long periods of deep depression after her marriage to Vincente and finally had a severe breakdown. ALL her friends went through another period of rationalization about her. Marriage hadn’t effected the change we had all hoped for; another child would. That was the special magic that could undo the conflicts, the hurts, the miseries. I was so simple. Up until this time, Judy had lived by the trouper’s credo, “The show much go on.” No matter what her personal problems or her state of health, she could be depended upon to be on stage on time, to work as long as she was wanted, and to give the best performance of which she was capable. This dependability changed; she appeared to fall apart. She was cast opposite Fred Astaire in “The Barclays [sic] of Broadway,” and didn’t show up on stage when shooting was to start. A new starting date was set and, again, Judy failed to show. This happened a third time. She was suspended. Ginger Rogers went into the picture with Astaire. I talked with Judy soon afterward, not as a reporter but as an old friend. “Can I help?” I asked. Judy was the old Judy in this picture. On the set when needed. At the top of her form. And the picture was a success. MGM bought the biggest musical hit of the season for her, “Annie Get Your Gun.” They paid a tremendous sum for it and spent at least a million dollars getting it ready for production. MGM was moved to take another chance; and cast her in “Summer Stock.” She went into it while she was still on a stringent reducing diet. If you watched carefully when the picture was shown, you could see her growing slimmer and slimmer as it progressed. She made herself unavailable when the time came for shooting to start. MGM suspended her, and almost at once the studio dropped her contract. Judy cut herself off from all her old friends. And, after a time – as always happens – yesterdays sensation dropped from sight. Suddenly there was news of her that made old friends joyful. Judy was making a comeback. She had a new manager who had booked her into London’s celebrate Palladium. 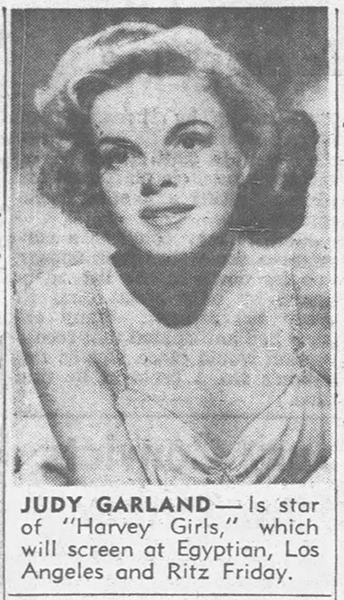 Judy opened to raves at the Palladium. The critical English audiences loved her. The critics praised her. I got first-hand reports that the new success was easing her mental and physical anguish. Her ego, so battered, was reacting to kind words and cheering people. For years it had been the height of every performer’s ambition to play the Palace. To headline the show there was an accolade. To BE the whole show was unheard of. Judy did the impossible. She bowled over the critics and the Standing Room Only sign went up each performance, to be repeated during the weeks she appeared at the theatre. 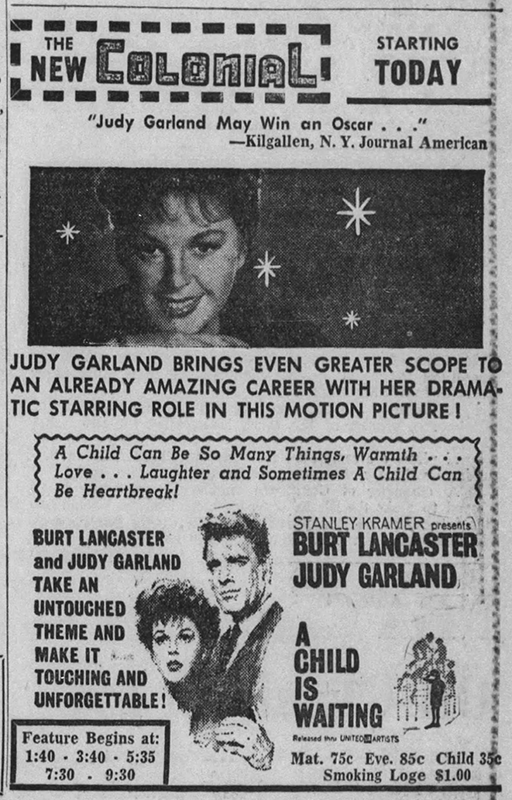 For nineteen weeks, eleven shows each week, Judy captivated audiences. The grind was, as it turned out, too much to ask of her. She suffered from hepatitis and had to be taken to a hospital. I talked to her then and knew from her voice that it wasn’t true that her past had caught up with her. It was hard to convince people that this was hepatitis plus a case of physical exhaustion, and that Judy had so completely thrown herself into her work that she had used up all her strength. Hollywood didn’t believe the true story either, as Luft found would when he came to Hollywood seeking a movie contract for her. LUFT determined to find the right property for her and produce it himself. 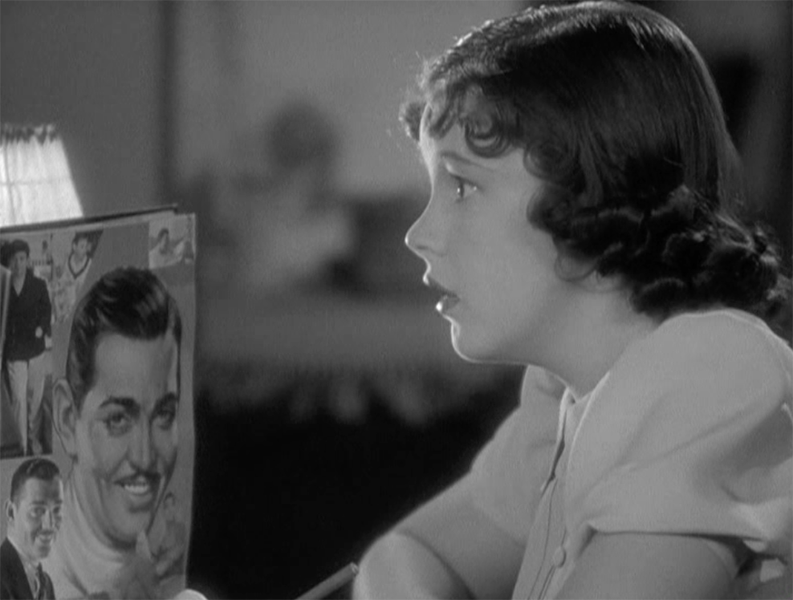 He decided on “A Star Is For,” which had been a great picture years earlier when David O. Selznick produced it with Janet Gaynor and Fredric March playing the leads. On Oscar night Judy was in the hospital having another baby. (She and Luft already had one child, Lorna.). All her special, hopeful, cheering squad – with me as cheer leader – was heartbroken when she didn’t win. I wrote a story about the happy Judy and said that it seemed she had at long last found happiness. I had put that word “seemed” in the story because I knew better than to make any absolute statements about her. And I was, unhappily for me in this instance, right. She and Sid had a raucous argument and she announced she was going to get a divorce. Then, shortly afterward, she telephoned me they had reconciled. Her career was slumping again, and for some time it seemed as if not even all her natural talent could ever bring her back to the top again. But that wasn’t so. She was booked for another engagement at the Palladium in London. Her English fans still loved her. Again she was a triumph. But this was a different Judy; and not simply older. Reporting on the two hours she held her audience captive as she sang 33 songs, a reporter declared that she was “pudgy and plump” but her voice, her stage presence, her ability to sell a song were greater than ever. That was the story, too, back in the U.S. the ovation Judy received Shen she gave a concert at New York’s Carnegie Hall in April, 1961 – when she was called back again and again for curtain calls – was proof positive that she had her greatest moment of triumph. By popular demand she gave a second concert at Carnegie and again received an ovation that I was lucky enough to witness. Very wisely, Judy had engaged Freddie Fields, Polly Bergen’s husband, to manage her. Freddie said he would do so on one condition – Judy must do as he said; there must be no outside interference. Sid Luft was content to go along with this in the beginning. But throughout their marriage money had been a problem. DESPITE the large sums Judy had made periodically, the Lufts seemed always to feel the pinch of lack of finances. With Freddie Fields in control, Judy was hanging on to her money for the sake of her children. This wasn’t easily acceptable to Sid, who had spent whatever he wanted. At first, they denied any trouble although it was obvious they were no longer happy together. She glanced over at the table where I was sitting nearby and her eyes were wet as she struggled to overcome her emotion. I believe now that Judy has a firm hold on herself. Not in the years I have known her have I seen her as self-possessed and as in control of her nerves as she is today. Yes, Judy who has Gove over the Rainbow so many times now has it draped around her shoulders by public approval. 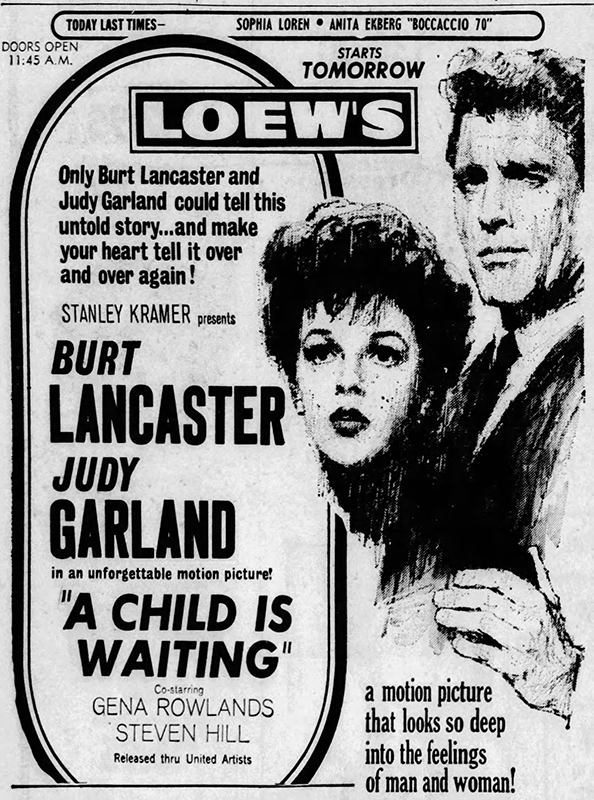 January 15, 1963: In theaters, A Child Is Waiting. January 16, 1967: Judy, Tom Green and his sister and brother-in-law, attended that evening’s performance of “Mame” at the Winter Garden Theater, sitting in the front row. 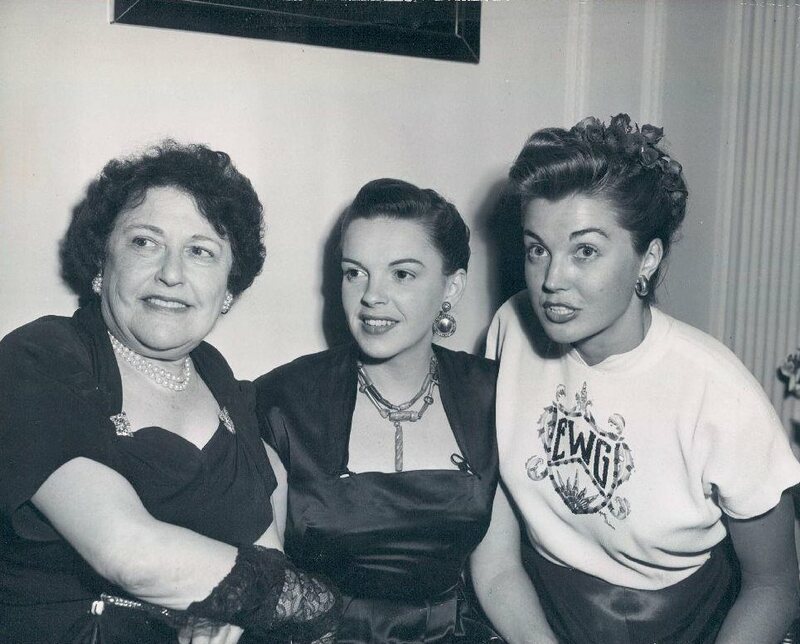 Judy wore the pink sequined gown from the TV series, “Episode Twenty-Five”; also seen on the 164 “Jack Paar Show.” The group visited with Angela Lansbury backstage after the show, which evidently irritated the theater’s coat check room as their wraps were still waiting to be picked up. 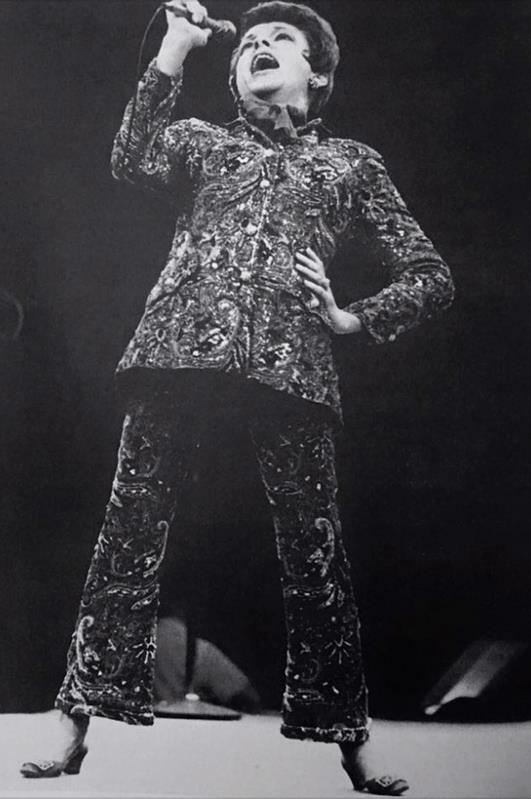 The audio file below is Judy attempting “If He Walked Into My Life” (from “Mame”) later that year, on June 13, 1967, her opening night at The Westbury Music Fair in Westbury, New York. Interesting stuff today, as always. Parsons’ usual claptrap, as evidenced by getting all of her dates wrong (Garland and Rose married in 1948??? ), and phony sentiment towards Judy (and people in general). Judy might’ve been able to handle “Show Boat” if she wasn’t thrown into “Royal Wedding.” She would’ve enjoyed a longer rest between “Summer Stock” and SB. Curiously, though, “Julie”, is a supporting character. In the end, I’m glad Gardner did the role (if only she would’ve been able to use her real voice, which was fine). Mame: Very sad. Nobody would’ve trusted Judy to show up every night and do that role sober, and in good voice. It was beyond her at that point.